I'm not a health food fanatic. But I do try to pick good foods... wheat bread, fat-free milk (preferably organic), granola for breakfast, stevia for the coffee. Somehow using these products makes it easier to eat something not so healthy like ribs (see Oct 28th post). Anyway, in the spirit of staff bonding, the CAM department at VCC had an afternoon break at Jamba Juice in Highland Village. 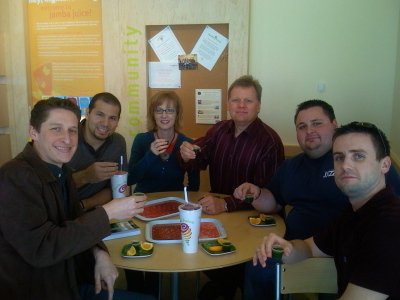 Here we are toasting 2 shots of Wheat Grass. Yes, Wheat Grass is good for you. It has a sweet grass taste that's not bad at all. And the benefits! Check them out HERE. Baby boomers, after years of making noise, face hearing loss and a new group of devices they once made fun of. As more members of the generation born after World War II enter their 60s, and the effects of age conspire with years of hearing abuse, a number find themselves jacking up the volume on their televisions, cringing at boisterous parties and shouting “What?” into their cellphones. About one in six boomers have hearing loss, according to the Better Hearing Institute, a nonprofit educational group. The AARP has reported that there are more people age 45 to 64 with hearing loss (10 million) than there are people over 65 with hearing loss (9 million). And more people are losing their hearing earlier in life, according to the National Institute on Deafness and Other Communication Disorders, one of the National Institutes of Health. Read more here.